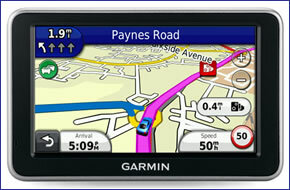 Garmin nuLink 2390 is equipped with 3D traffic, Garmin nuLink 2390 provides a multi-dimensional traffic solution. With real-time online content including Google Local Search, and more with Garmin nuLink services¹, it’s got everything you need while on the go. Garmin nuLink 2390 includes street-level road maps for the UK, Western and Eastern Europe on a 4.3-inch touchscreen display and also features Automatic Speech Recognition (ASR) technology which allows Garmin nuLink 2390 to respond to your spoken navigation commands. Garmin nuLink 2390 has been discontinued. An ultra-thin, pocket design, affordable and simple-to-use sat-nav that enables you to talk on your phone, handsfree. The Garmin nuLink 2390 comes with preloaded maps for the UK and Western Europe and has ecoRoute to calculate a fuel-efficient route. It is compatible with the optional CityXplorer download to get you around on foot or public transport, and you can even add City Guides to make the most of your time in town. Garmin’s 3D traffic is a multi-dimensional feed of the most accurate data collected from 80 million expert sources. With historic, real-time and PhotoLive traffic data, Garmin 3D traffic ensures you have accurate information at any time of the day. It includes a free 30 day PhotoLive trial giving you live feeds from traffic cameras along your route (where available) so you can see for yourself whether there are any hold-ups. The Garmin nuLink 2390 comes with a year’s free subscription to nuLink live services which include 3D Traffic, Google Local Search, weather reports, Speedwatch red-light and safety camera alerts and Dynamic parking which tells you the latest prices and whether there are spaces. There are many other services available and even more via the nuLink store (on the device) such as Phone Book, fuel prices, flight status and PhotoLive traffic cameras. nüRoute myTrends learns your driving habits to predict where you're going so you don’t even need to type it in a route. This is ideal for warning you of traffic along your route. With trafficTrends, the Garmin nuLink 2390 takes information from other drivers to better estimate your time of arrival based on time of day and day of week. Garmin’s PhotoReal Junction View shows actual junctions that have been digitised² to display incredible detail, even down to trees and pylons. The Garmin nuLink 2390 Lane Assist shows the correct lane choice for upcoming junctions and motorway exits. The Garmin nuLink 2390 split screen design allows you to see the junction and your position in relation to it, right up to the junction itself. Talk to your sat nav! Automatic Speech Recognition (ASR) technology allows Garmin nuLink 2390 to respond to your spoken navigation commands. This means you can control it with your voice while keeping both hands on the wheel. Bluetooth wireless technology also enables hands-free calls with compatible mobile phones. More features go beyond navigation. For example, Garmin tracker allows you to invite a friend or family member to monitor your progress, so they can see that you safely arrived home. The ecoRoute fuel-saver feature helps you save money and fuel and reduce your carbon footprint. There is also the option to add cityXplorer mapping to include directions on foot as well as public transport (dependent on the city). You can even customise the main menu to show the icons you want and use the most. ¹One-year data subscription to nuLink services included with purchase of Garmin nuLink 2390 while offer lasts. nuLink services only available in select coverage areas. ²Not available at all junctions in all areas. The Garmin nuLink 2390 has been designed to be plug and play, and as such can be transferred from vehicle to vehicle with ease. The Garmin nuLink 2390 is powered via the supplied vehicle power cable. The Garmin nuLink 2390 then attaches to your vehicles windscreen via the Garmin nuLink 2390 suction cup mount. Alternatively using the supplied dashboard disk you can mount the suction cup mount on top of your dashboard instead. Garmin nuLink 2390 comes preloaded with detailed City Navigator street maps for UK, Ireland and all Europe (45 countries) with 90 day nuMaps Guarantee provided from map supplier NAVTEQ. Rolling screen transition, accelerated map redraw and routing capabilities make screen zooming even smoother and ensure the navigation always matches your pace.